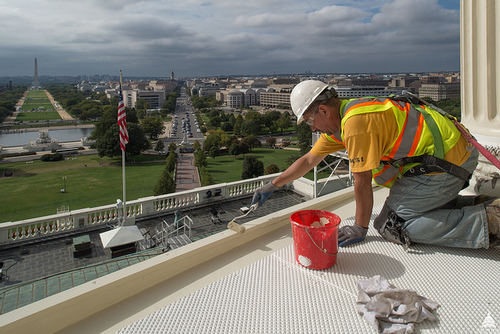 After three years and 1,215 gallons of paint, the restoration of the U.S. Capitol dome, the first of its kind in more than 50 years, is complete. 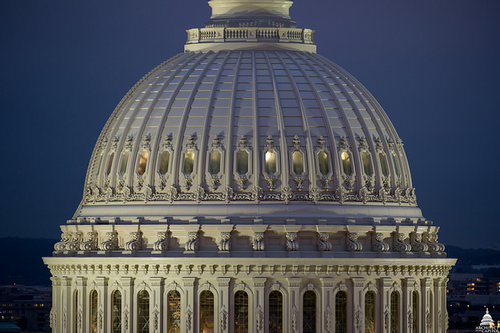 The U.S. Capitol dome restoration was officially completed on Nov. 15. The dome project was officially completed on Nov. 15. The dome, constructed of cast iron between 1855 and 1866, sits atop the much older Capitol building, which was completed in 1800. 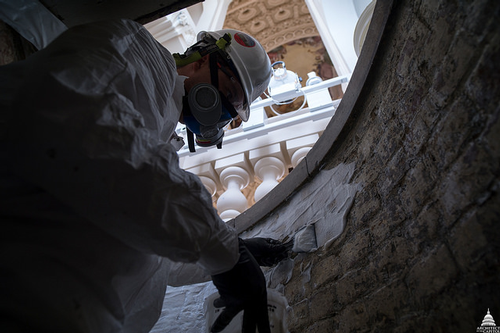 In 2013, the dome restoration project began, aimed at repairing more than 1,000 cracks and deficiencies found in the structure. When it was announced in 2013, the project was estimated at $60 million, with a joint venture of Turner Construction Co. and Smoot Construction winning the contract as lead contractor. The contractors worked directly with Architect of the Capitol Steven D. Ayers, FAIA, whose office oversees the structure. The AOC says the project ended up within the authorized budget of $59.55 million, and was finished within its original timeline, which ensured that the restoration would be done before the January 2017 presidential inauguration. The restoration involved the repair of the hundreds of cracks in the dome; lead abatement due to the age of the coatings on the dome; the repair and replacement of windows in the dome; coating with a primer, mid-coat and topcoat; and the installation of a bird deterrent system. In September 2015, President-elect Donald Trump, speaking on the campaign trail, said that unnamed sources told him the project was behind schedule, and that the scaffolding around the dome would be taken down during the inauguration, then put back up, at a cost of millions. The AOC said at the time that the project was on schedule; the last of the scaffolding was taken down in October 2016. According to the AOC, water had been infiltrating the dome through pinholes in the Statue of Freedom, which sits atop the dome, and seeping inside, causing rust and damage. Much of the surface preparation, lead abatement and coating work was performed by Medford, OR-based F.D. Thomas, a commercial painting and waterproofing firm with more than 30 years of experience. According to an article published in the Medford Mail Tribune prior to the start of the painting, F.D. Thomas also anticipated taking part in the onsite repair of the cast-iron pieces, a process that utilized the Lock-n-Stitch and “Dutchman” techniques. The paint on the dome was applied in three coats of about 405 gallons each. An AOC spokesman told Durability + Design that for "the exterior of the Dome, the topcoat was fluropoloymer, along with the epoxy primer and mid coat (brand name Macropoxy 646)." The topcoat, the office says, is "engineered to withstand the elements and shed dirt, making them easier for AOC staff to maintain." The topcoat color is called “Dome White." On the interior of the rotunda, the wood and iron "was painted with two coats of Benjamin Moore Eco Spec water-based latex paint on top of one coat of their commercial brand Corotech alkyd primer," AOC told D+D. According to the AOC, EverGreene Architectural Arts was also contracted on the job. New York-based EverGreene specializes in preservation and conservation of murals and decorative work as well as plaster and other decorative finishes, performing surface preparation and coating work, according to its website. The offsite restoration of cast iron components, including the creation of replica ornamentation to replace ornaments that had broken, was done by Historical Arts and Casting, of Jordan, UT. The project also required the artwork inside the cupola, as well as visitors down below, to be protected, which contractors did by installing coverings, including a donut-shaped protective canopy, inside the dome. A big job in and of itself was the installation and eventual removal of the 1.1 million pounds of scaffolding, which the AOC says consisted of 52 miles of scaffold pipe and 2 miles of decking. The scaffolding obscured the appearance of the dome for over two years. The Statue of Freedom was not part of the restoration this time around; the statue had its last full restoration in 1993, and is cleaned and given a fresh coat of epoxy once every two to five years, most recently in 2015. Editor's note: This story was edited Tuesday morning, Nov. 29, to reflect addition details supplied by the Architect of the Capitol regarding specific coating types used. Why is an epoxy used on the Statue of Freedom, given its poor light(UV) resistance?